Bring the essence of a majestic oak tree into your home or onto your deck using the Whitehall Oak Leaf Nature Hook. An upwardly arched branch shape creates the body of this item, adorned with a wealth of oak leaf and acorn figures for drama. Texture and detailing throughout the branch, acorns, and leaves offer a realistic look, and the dark bronze color creates an elegant feel. Lighter bronze hues on many of the recessed portions add contrast to this hanger. A bit of the branch shape extends past the leaf ornamentation, creating a convenient spot to hang your bird feeder, lantern, or other hanging accessory up to 30" in diameter. Use the two included screws to secure this bracket to a wall or post, for versatility in placement. The aluminum construction creates a sturdy item, easily withstanding the elements for years of use. 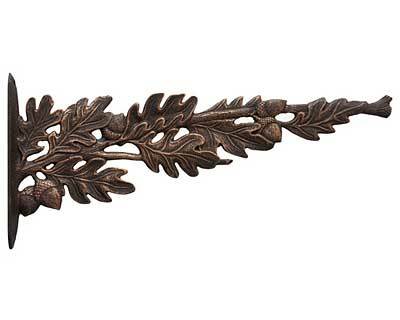 Enjoy a bit of the forest on your wall with this Oak Leaf Nature Hook. Made in the USA.